We tell the story of one of our newest brands to be stocked here at the Home of Golf: Fore Kids Golf. Fore Kids Golf was started by Kelsey McLean after attempting to purchase an item for her then unborn son whilst 8 months pregnant at her local pro-shop. Surprised to discover that there wasn’t anything available for babies and toddlers, remarkably, Kelsey decided to launch her business just one month after giving birth in February 2012. Fore Kids Golf was born. In carrying out market research, Kelsey discovered Peru is famed for the production of baby and kids’ products (particularly cotton) of exceptional quality. Coupling this with the knowledge that golf clubs are becoming increasingly focused on families in conjunction with the PGA of America’s “Grow the Game” initiative; the foundations of Fore Kids Golf were beginning to take shape. With help from husband, Robert, Kelsey developed a classically styled clothing line designed to be embroidered with club logos that includes polo’s, baby bodysuits, dresses, hats, blankets, bathrobes and trousers. 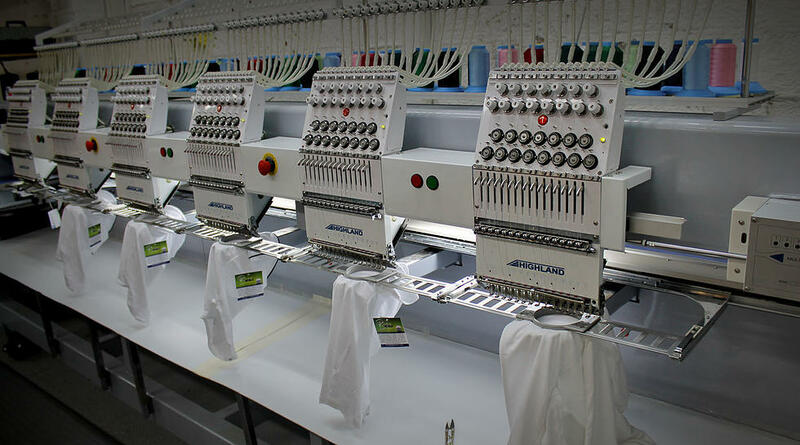 Almost all of their products are 100% Pima cotton, made in Peru and embroidered in Pennsylvania at the family’s impressive in-house embroidery facility and warehouse (below). The brand debuted at the PGA Merchandise show in Orlando in 2013 and has since gone from strength to strength. 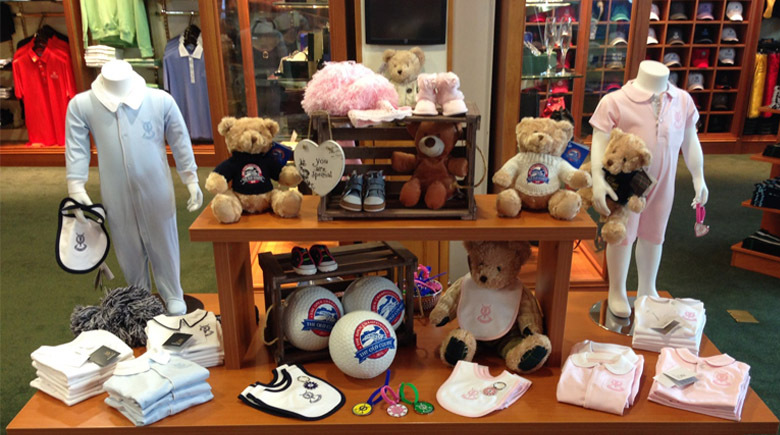 Fore Kids Golf is stocked at many of the USA’s top golf resorts including Medinah Golf Club, Merion Golf Club and TPC Sawgrass. The company is also the preferred vendor for the Ritz Carlton Hotels and a member of the Association of Golf Merchandisers. Most notably they were one of the presenting sponsors of the exclusive PGA Merchandiser of the Year conference in 2015 where they showcased their classic country club styles in shades of pink and blue. After initial trailing and testing, the range’s quality and niche appeal really impressed us here at the Home of Golf. We were delighted to introduce Fore Kids Golf to our shops but took the decision to start small by bringing in a collection of eight pieces split evenly for boys and girls. 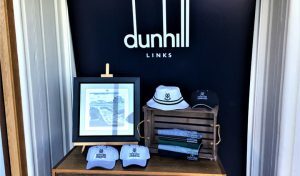 The collection is pictured on display in the Old Course Shop (header image). A key item in the collection which is already proving popular with our customers is the baby’s bodysuits. 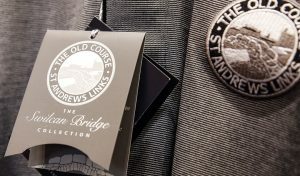 These are available in white with either navy, pink or white piping detail to complement the St Andrews Links logo. Another firm favourite is the baby girl’s romper which is available in pink with a complementary pink logo. This particular piece also works well with a coverall, available in pink for girls and blue for boys. Finally, no kids’ collection would be complete without a baby bib! 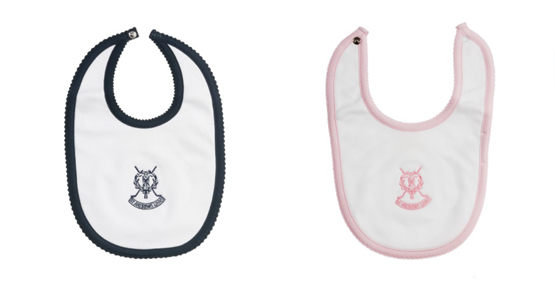 Our baby bibs are available in white with either a navy or pink trimming and feature a matching St Andrews Links logo. Having only stocked Fore Kids Golf in our stores for a short time, we are excited to see how the collection progresses as we approach The Open, which returns to the Old Course in July. 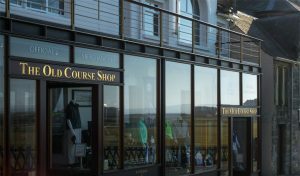 We look forward to welcoming our customers into the Old Course Shop to view the collection. If you can’t make it to St Andrews then not to worry, the collection can also be viewed online.